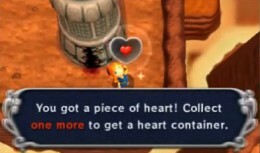 Heart Pieces are a staple of The Legend of Zelda games. The premise is simple: find four Heart Pieces and you'll receive a permanent single-heart boost to Link's overall health. The more hearts he has, the more hits he can take in battle. Link can also earn Heart Containers by beating dungeon bosses, but it can't hurt to have seven extra hearts, now can it? This guide will help you locate all twenty-eight Heart Pieces in The Legend of Zelda: A Link Between Worlds. They are found in Hyrule and Lorule alike, and in some cases you'll have to travel in one world to find a Heart Piece in another. - There's a Heart Piece along the eastern wall of Hyrule Castle. It's sitting in plain sight, but you'll need Power Gloves to get stones out of the way and reach it. - Return to the Sanctuary sewers after gaining the ability to merge with walls. Walk through the largest part of the sewers until you're on a grid walkway. Follow the walkway east and merge with the wall once you reach the end. Slide further east to find a Heart Piece. - Merge with the wall of the Blacksmith's House and shimmy to the north. Out back you'll find a Heart Piece on a cliff edge. - At the base of the Blacksmith's House is a cave blocked by a huge stone. Lift it with the Titan Mitts and you'll find a Heart Piece in the cave. - There's a well in northwest Kakariko that leads to a Heart Piece. You can either wait until you have the Power Glove and use it to heft the two rocks blocking the well out of the way or float into the well while clinging to a cucco. - South of Kakariko is the Cucco Ranch. Play Cucco Rush here and complete Rooster difficulty to earn a Heart Piece. - Also south of Kakariko is the Rupee Rush game. Complete it with a minimum of 100 rupees collected to earn a Heart Piece. - There's a giant rock blocking a cave at the base of the Blacksmith's House. Use the Titan Mitts to remove it and you'll find a Heart Piece in the cave beyond. - Explore the eastern-most section of the Eastern Palace's outer grounds once you have Power Gloves and Bombs. You'll find a hole to blow open which leads to a Heart Piece. Merge with the wall to reach it. - Search the canyons found one screen south of the Eastern Palace, on the border with Lake Hylia. There's a Heart Piece sitting here, penned in by poles to knock down with the Hammer. - On the eastern end of Lake Hylia you'll meet a racer who invites you to play Hyrule Hotfoot, a dash from Lake Hylia to the outskirts of the Lost Woods. Complete Hyrule Hotfoot twice, the second time within 65 seconds, to earn a Heart Piece. - South of Zora's Domain is a waterfall. Drop down in front of it by swimming south from Zora's Domain and enter to find a Heart Piece. - The enormous lava room you find while following the Ross's Ore Mine signs you'll find a platform with two fire-breathing monsters. Merge with the left wall on this platform and you'll find a spring platform moving back and forth nearby. This marks the beginning of a series of spring platforms which will, eventually, lead you to a Heart Piece. Make sure you come in with plenty of health, as there's some trial-and-error involved. - Roughly in the middle of the Lost Woods you'll find a hollowed log positioned horizontally. You can merge with the rock wall found halfway through the log and slip south, whereupon you'll find a Heart Piece in a small clearing. - Check the southeast area of the Swamp. There's a Heart Piece sitting in front of a small cave, but both it and the cave are blocked by statues. A short ways southeast you'll find a cliff edge, at the bottom of which are two statues flanking blank wall. Blow open the wall with a Bomb to find a path to the Heart Piece. - There's a ridge in the northeast of the Desert which you can climb. Beside it is a crack leading to Misery Mire. Use a Bomb to blow the crack open and slip through to find a Heart Piece. - Behind the Graveyard is a ladder leading to a crack to Hyrule, masked by rocks. Blow it open and slip through to find a cave on the other side. Inside is a Heart Piece. - One of the houses in Thieves' Town has largely been destroyed. In the house, however, is a crack leading to Hyrule. Pop through to enter a young woman's house. She'll give you a Heart Piece. - There's a Fortune's Choice game in Thieves' Town. For 200 rupees you can open three out of fifteen chests. One of these chests contains a Heart Piece. The placement of the Heart Piece is random each time you play. - Play Octoball Derby, southeast of Thieves' Town, and score over 100 rupees during a single play. This will earn you a Heart Piece. - Play Rupee Rush, south of Thieves' Town, and collect a minimum of 150 rupees with three seconds or less to spare. Doing so will earn you a Heart Piece. - Merge with the building in Lorule that corresponds with the elder's house in Hyrule. In a nook on the front of the building waits a Heart Piece. - In the northeast corner of this area is a broken-down shack (the Miner's House in Hyrule, where you can find a crack between worlds). Climb up to the cliffs one screen south and use the buzzard to fly from the top ledge, down onto the shack's remaining porch. There's a Heart Piece atop it. - Enter the southwest chamber on the first floor of Turtle Rock, and freeze the lever beyond to reach a teleporter. Beyond here you'll find a large pool of lava. Use the Ice Rod to travel from one platform to another. Through the door beyond this lava is a Heart Piece. - In the southeast corner of the swamp is a cave blocked by an enormous rock. Use a Bomb Flower to blow open the cave. A Heart Piece waits inside. - Near the second jail cell on the Dark Palace grounds is a raised area patrolled by guards. A Heart Piece is sitting on a pole near the end of this area. - On the east side of the mountain you'll have to ascend through a gigantic cavern full of moving platforms to reach the Ice Ruins. Halfway through this area you'll have to destroy a large ice gargoyle. This same platform is a meeting place for several moving platforms. Hop on the western platform and ride it to another stable platform. Wait for a few seconds until a platform to the north drops down. Get on and use it to ascend to an exit, using the Tornado Rod along the way. At the top is a crack leading to Hyrule, and through it you'll find a Heart Piece. - Complete the Treacherous Tower on Intermediate difficulty to earn a Heart Piece.